Unlike other dental clinics, the St. Louis Dental Center is a part of a dental teaching institution - the Missouri School of Dentistry & Oral Health. We offer a range of dental services similar to many private dental offices. Our faculty’s expertise and available technology allows us to offer more services than many other clinics. We offer general and specialty dental services including urgent care, comprehensive exams and individualized treatment plans, periodontic care, restorative care, oral surgery, and many others. There are 93 total chairs in our state-of-the-art facility to provide compassionate care for all those seeking it. Community health centers (CHCs) are community-based and patient-directed organizations that serve populations with limited access to healthcare. 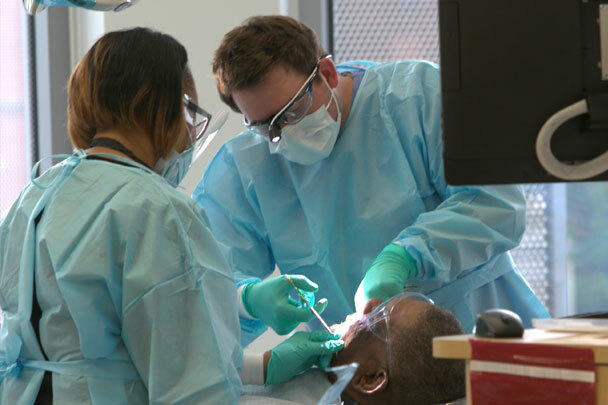 The St. Louis Dental Center is made possible because of a unique partnership between A.T. Still University and Affinia Healthcare. Affinia Healthcare is an established Federally Qualified Health Center providing access to affordable healthcare resources, including dental care, for more than 100 years. CHCs are expected to serve as core safety net providers in meeting the increased demand for care and maintaining delivery of clinical preventive services in the communities they serve.